Distributed object technology has been the mainstay of many corporations for many years, providing a well-defined mechanism for enacting complex yet predictable business processes across the corporate network. It has been used to simplify client-server systems and connections to remote database through the use of object-oriented APIs, which stemmed from the popularity of the object-oriented programming paradigm. To provide this context, the concept of objects is discussed in the next section and then related to how these can be transferred across a network within distributed object systems. The two distributed object systems we focus on in this book are CORBA and Jini, although we also discuss in Section 8.3 how distributed objects relate to the popular agent paradigm. An overview of the salient features of CORBA is discussed in this chapter in Section 8.2 but Jini is discussed separately in Chapter 14. However, the underlying Java serialization and Remote Method Invocation (RMI) mechanisms for Jini are discussed here in Section 8.5 in order to illustrate how the state of a Java object can be saved and passed across a network as an argument to a remote method on a distributed object. This mechanism is illustrative of the underlying problems that need to be addressed within any distributed object system. 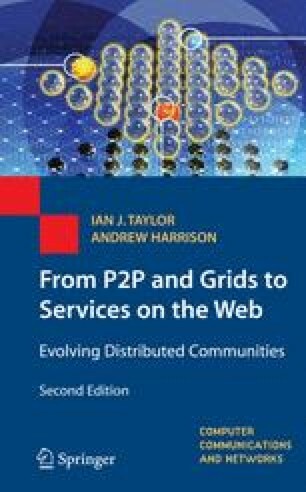 Further, the same serialization mechanisms also need to be addressed in systems based on XML technologies, such as Web Services, which were discussed in the previous chapter. However, distributed object technologies differ in approach to Web Services in a number of ways but primarily because they maintain state across the distributed entities in the system.